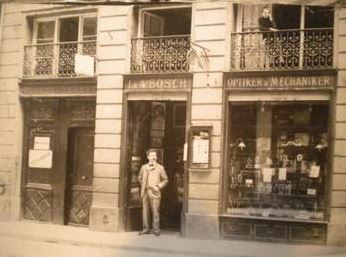 Joseph and Albert Bosch manufactured mechanical instruments in their shop in Strasbourg in Alsace starting in 1888. Alsace was then part of Germany following the Franco-Prussian War. They manufactured meteorological instruments but are perhaps better known today for the seismographs they manufactured. After Word War I Alsace was returned to France and the Boschs were forced to leave. The company they founded continued to operate in Strasbourg under a new owner, Emil Schuhl. Joseph Bosch continued to make mechanical instruments in Hechingen, Germany in the 1920s. He died in 1929.